An important step in knowing what kind of camping tent is right for you is knowing what types of camping tents are out there. Below are some descriptions of some of the more popular camping tents. Family camping tents are made for just that – a family. Therefore, they are often the largest tent types, intended for larger groups (4 people or more). As most family camping is done in the summer-time, such tents should be designed for effective ventilation and made of lightweight fabric. Look for mesh doors and windows as these features allow air to circulate (it can get pretty stuffy inside a tent in the summer heat). In a group of people, it doesn’t take long to feel cramped. If your family primarily stays at a campground while camping, the weight of your tent shouldn’t be a main concern. Therefore, extra space found in larger family tents is a good idea. Most offer 1-3 rooms for sleeping or storage of equipment; obviously, the more room, the more privacy. Family camping tents are also taller, ranging from about 6-8+ feet at the peak (in the middle of the tent). There are a lot of cheap options in this category, but purchase with caution; many are cheaply made. If you are travelling with a family (complete with children), remember that likely the tent will be subjected to constant – and sometimes ungentle – traffic. Cheap tents are often more difficult to maintain and you may start to find them more of a hassle than a bargain. Cabin tents are big. Like the typical family camping tent, many have multiple rooms, with high ceilings and large windows. Some are so roomy, in fact, that they can hold large items like a picnic table or wood stove. Cabin tents are based on frames and quite durable. For this reason, they are heavy (35-160+ pounds), unwieldy, take a while to dry, and take around an hour for experienced campers to set up. However, if size and weight are not issues (and if you think you’ve got what it takes to pitch one) a quality cabin tent may be a great option. Three-season tents are good, general purpose tents. Most camping situations (unless you plan to camp in serious winter weather) generally require a three-season tent. They are designed perfectly for spring, summer, and fall. This means that they provide adequate protection in all weather conditions except in extreme snowfall or wind; the tent’s poles are not designed to support the weight of snow. Although the three-season tent is heavier than, say, a family or cabin tent, they are less expensive, lighter (4-10 pounds) and more compact (3-5 feet tall at peak). For these reasons, and for their seasonal versatility, this type of tent is popular with backpackers, hikers, cyclists and paddlers; they are just as great for recreational camping, too. Such tents offer excellent ventilation. Many have more open and zipped panels, as well as mesh inner bodies which help to greatly reduce condensation. Without a fly, the three-season becomes cooler – while still remaining bug-proof – on hot nights. Some types of three-season tents include tarp tents (minimalist shelter helps keep rain off of you and your sleeping bag, but bottoms are open); tunnel/hoop tents (narrow in shape, light due to less poles and fabrics, but not too strong). Four-season tents include winter camping. If you plan to camp in extreme weather, a four-season tent is best. As they cover all the seasons, four-season tents are the most versatile of all tents. They are generally smaller tents, meant for 1-4 people. Meant to protect campers in heavy weather, the four-seasons are usually more weather-proof and are made with heavier fabrics that have thick, waterproof coating. The tents are built low and have vertical or curved walls (3-5 feet tall at peak) to shed snow and large vestibules for cooking and storage. Because their flies generally reach the ground, the four-seasons are less ventilated and so more likely to have interior condensation. Although the four-seasons do have a greater weight (4-15 pounds) and pack size than the three-season tents, they are easy to use and you may find that the added versatility makes up for the extra weight. Just remember that four season tents are still not intended for the even more extreme conditions of mountaineering. A mountaineering tent is sometimes called a “fifth season” camping tent. They are designed specifically for harsh conditions (in higher altitudes, along cliffs/mountains, etc.). Designed to be as light as possible, mountaineering tents do not have the space that is found in regular-sized tents. They have lower profiles, larger and thicker aluminium poles and increased use of guy points. Mountaineering tents are manufactured and shaped to shed snow and to remain resistant to strong winds. These are not built for comfort or recreational camping. 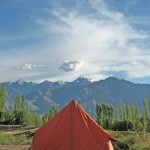 For backpackers, the weight of their tent is one of the most important factors. As the tent will most likely be carried on their backs, backpackers require a tent that is lightweight while still meeting their specific needs. This often means that size, and thus roominess, is sacrificed. Depending on the weather conditions you plan to backpack in, a three-season tent or a solid and lightweight four-season tent are suitable. Just make sure that the tent is high quality, able to withstand any rough weather you might encounter. If there are two of you backpacking, one tent should be enough between you. However, if you have a larger group, it may be easier to bring along a few smaller tents, rather than one large, heavy and bulky one. Of course, you could always distribute the pieces of a larger tent amongst group members. Some types of backpacking tents include bivy sacks/shelters, camping hammocks, and sleep screen. Bivy sacks are small shelters (.5-3 pounds, 1.5-3.5 feet high) for minimalist campers. They are made to fit you and your tent, but little else. Camping hammocks are combinations between hammocks and tents and extremely light. Sleep screens are also minimalist, lightweight and designed for warm weather. Mesh helps to keep the bugs away, but not rain. Dome tents are very popular. 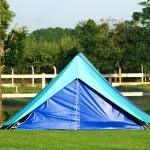 They are great as three-season or summer/family tents and less expensive than cabin tents. Though small, they are very stable (not to mention strong with aluminium poles) and offer a nice amount of headroom. Dome-shaped, dome tents are made to shed snow and rain; they resist wind well with the aid of a rain-fly. Dome tents are rather easy to put up with their free-standing design; they don’t require guy lines or tent stakes to remain upright (although they are needed to keep from blowing away!). Convertible camping tents can convert from a four-season tent to a three-season. To do this you must remove the tent cover, a couple of the poles and open the zippered windows for ventilation. Standard weight is usually 5-12 pounds and peak height 3.5-5 feet. Single wall tents are less bulky and heavy (their design doesn’t include flies making their weight closer to that of bivy sacks) than four-season tents. Single wall tents are made of waterproof, breathable material which means that they function best in cool and dry conditions, above snowline. Bear in mind that they do not do as well in high humidity or heat of summer or sea level. Screen tents have mesh sides to keep away insects, but their tops are waterproof to withstand wind and rain. 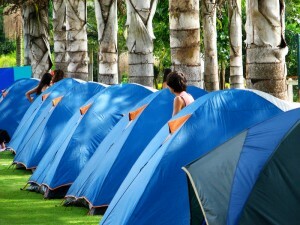 These tents are great because of their high visibility which allows you to enjoy your surroundings. No responses to "Types of Camping Tents"